If I could somehow merge each differential feed test, every practice rib band attachment and all the trial sleeve insertions into SWEATERS, my crafted fashion wardrobe would be much bigger by now. But I can't. And Turtle Beach is only the second cut and sew sweater I've completed. Practice does indeed make improvement. Once I was actually satisfied with the cut of the neckline, (Third time's the charm.) everything went quickly and easily. I no longer set in my set-in sleeves; I use the flat method and sew the side seams later. It's faster. Serging in the round? No problem -- I just may do a tutorial on the topic one day. Working with this fabric was a bit of a surprise for me. I know this sounds strange coming from the designer/knitter of the fabric, but up until this point I'd only cut and sewn 100% wool. 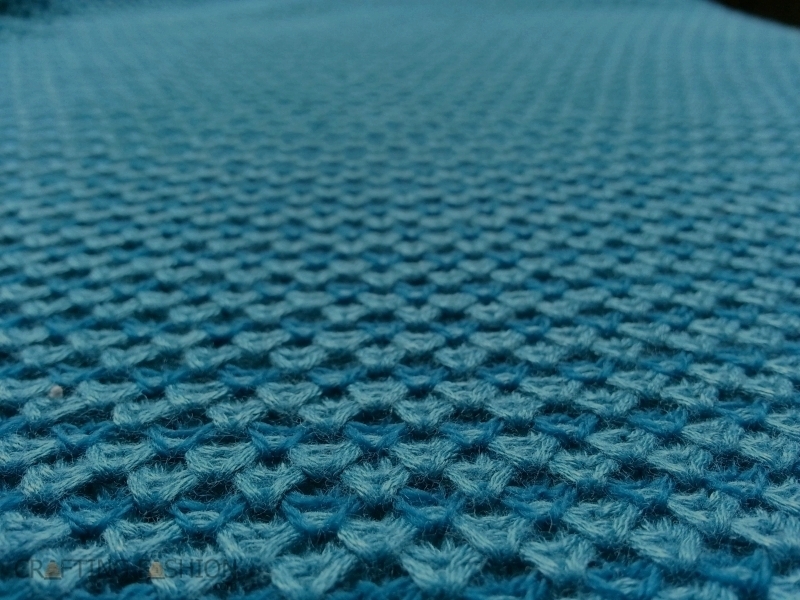 The Turtle Beach fabric (available here) is mostly bamboo -- 86% bamboo and 14% merino wool. I love the subtle sheen and the drape of the material, but frankly, the fibers of bamboo yarn are more slippery than the wool fibers I've gotten used to. I hadn't had any raveling issues with 100% merino wool Providence sweater knit fabric, but I had to be careful with this bamboo/wool combination. I wouldn't label it a huge problem, but where previously I'd imagined getting by with less than 1/2 inch seam allowance, I was very happy for the 1/2 inch this time. The Turtle Beach sweater is very comfortable with its 3/4 sleeves, easy scoop neck and contoured, but not-too-tight fit. I love the feel of this fabric against my body. The bands at the neck and cuffs are doubled merino wool jersey, attached in exactly the same way I attach rib bands. I decided against a band at the bottom, however, because of the drape of the fabric. I hemmed the bottom instead. 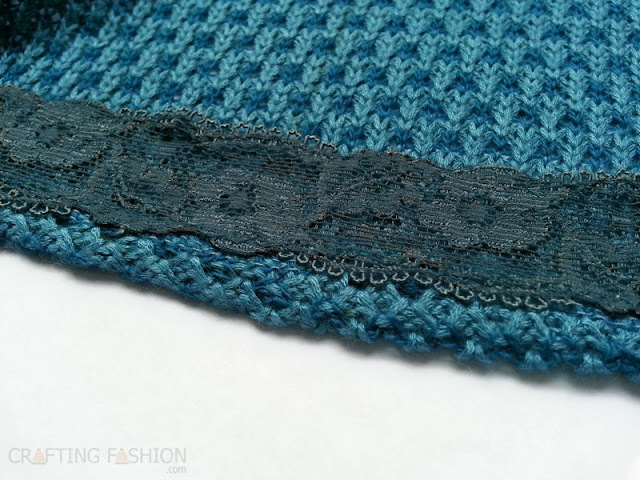 I've always loved lace hem facing, but I discovered that it's rather stiff and scratchy compared side by side to the elastic lace used for lingerie. So, lingerie elastic lace it is! I'm beginning to feel more confident with my cut and sew skills. And I'm ready for something dramatic next time. This is absolutely gorgeous. I'm so glad you finally got the neckline how you wanted it for this project. And I LOVE elastic lace. I kind of wish I had a spool in every color. Thank you! And yes, now that I know about it, I could use more elastic lace, too. So pretty! I love elastic lace as well.